When do patients require glaucoma surgery? Patients are generally referred for glaucoma surgery when there is evidence that eye drops are not effective in slowing down the progression of glaucoma. The progression of glaucoma is concluded after careful analysis of investigative tests such as the Humphrey Visual Field Analyser 3 and Optical Coherence Tomography. Edgbaston Eye Clinic is very fortunate to be associated with one of the most prominent glaucoma surgical specialists. All my patients that require further specialist glaucoma investigation would be referred without delay to the glaucoma surgical specialist. The commonest out-patient laser procedure for glaucoma. SLT is a procedure used to reduce pressure in the eye (also known as intraocular pressure). If you have healthy eyes, the fluid in your eye (aqueous humour) flows through your pupil into the front of your eye. It then drains away through drainage channels inside the eye called the trabecular meshwork. These drainage channels are situated in the angle of the eye, which is where cornea (clear front layer of the eye) and iris (coloured part of the eye) meet. However, in some eyes these drainage channels do not work properly so your eye pressure increases. This increase in pressure may injure your optic nerve (the nerve that carries information from your eye to your brain) and impair your vision. This is called glaucoma. In SLT, a laser beam is applied to the drainage channels, which helps to unclog them. This means the aqueous humour flows through the channels better, reducing the pressure in your eye. A procedure that needs to be performed in the theatre under local anaesthetics. This is a type of laser used in patients with glaucoma where other types of treatment have failed or would be of little use. If you have healthy eyes the fluid in your eye (aqueous humour) flows through the pupil into the front of the eye. It then drains away through drainage channels. If you have glaucoma, the fluid in the eye cannot drain away properly. This can result in a build up of pressure within the eye. This high pressure injures your optic nerve – the nerve that carries information from your eye to your brain – and damages your vision. The Cyclodiode Laser is a highly concentrated beam of light, which can be used to target and treat a selected area. The aim of the laser therapy is to lower the pressure in the eye, by reducing the production of fluid within the eye. The reduced production of fluid causes the eye pressure to fall. This laser procedure works like turning down the ‘tap’ inside the eye. As a procedure it is useful in acute glaucoma condition when there is a sudden high pressure, e.g. acute angle closure attack. This procedure sometimes can cause excessive inflammation inside the eye and occasionally can cause chronic low pressure in the eyes, therefore this is not normally used for routine glaucoma conditions. Cyclophotocoagulation is like the cyclodiode laser but instead of applying the laser from outside the eye, this is applied from inside the eyes with an endoscope. This procedure usually combined with cataract operation that the laser probe is inserted inside the eye to deliver the laser energy to burn off the ciliary body epithelium in order to reduce the amount of water production inside the eye. Also, this procedure can cause excessive inflammation but less likely to cause chroinic low pressure problems. Trabeculectomy is a surgical operation which lowers the intraocular pressure inside the eye (IOP) in patients with glaucoma. This is achieved by making a small hole in the eye wall (sclera), covered by a thin trap-door in the sclera. The fluid inside the eye known as aqueous humour, drains through the trap-door to a small reservoir or bleb just under the eye surface, hidden by the eyelid. The trap-door is sutured (stitched) in a way that prevents aqueous humour from draining too quickly. By draining aqueous humour the trabeculectomy operation reduces the pressure on the optic nerve and prevents or slows further damage and further loss of vision in glaucoma. Control of the eye pressure with a trabeculectomy will not restore vision already lost from glaucoma. Glaucoma is often caused by high pressure inside the eye. Trabeculectomy reduces the eye pressure by draining aqueous humour from the eye. The aqueous humour is a fluid inside the eye which is not related to the tears. Watering of the eye is caused by tears, not aqueous humour. The aqueous humour that drains through the trabeculectomy accumulates in a reservoir between the sclera and the surface layer of tissue that covers the eyeball (the conjunctiva) to form a small drainage bleb that is usually hidden under the upper eyelid. MIGS procedures has become very popular in recent years. The most commonest MIGS procedure performed is the iStent implants; commonly done in combination with cataract operation. 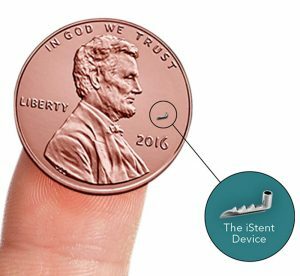 The iStent is a tiny one-millimetre-long tube that is inserted into the natural drainage channel of the eye to help lower eye pressure and reduce the need for medications. The iStent is so small you will not see or feel it after the procedure. It is made of surgical-grade titanium so it won’t be rejected by the body. It will not set off airport scanners and is safe if you need to have an MRI scan. The advantage of this iStent procedure is that it would not affect further glaucoma procedures if this is become necessary in the future. Complex Glaucoma Surgery: Edgbaston Eye Clinic is fortunate to be working with a highly skilled glaucoma surgeon that can perform these procedures. Aqueous shunts are devices that are used to reduce the intraocular pressure (IOP) in glaucoma by draining the fluid (aqueous humour) from inside the eye to a small blister or bleb behind the eyelid. Reducing the pressure on the optic nerve in this manner prevents further damage and further loss of vision in glaucoma. Please note that control of the eye pressure with an aqueous shunt will not restore vision already lost from glaucoma. The aqueous humour is a fluid inside the eye and is not related to the tears. Aqueous shunts have various other names such as tube implants, glaucoma tube shunts, glaucoma drainage devices, glaucoma drainage implants and setons. These names all refer to the same thing. Although there are many types of shunt available, two brands are in common use today and they function in a similar fashion. These are called the Ahmed Glaucoma Valve and the Baerveldt Glaucoma Implant. These shunts are made up of a small silicone tube (less than 1mm in diameter) attached to a plate. The tube takes the aqueous humour from inside the eye and drains it to the plate which sits on the white of the eye (sclera). The plate sits under the skin of the eye conjunctiva), behind the eyelid.